Click for larger, readable version. Opens in new window. One of our readers in Australia, Peter, sent us this article written in 1989 by Alan A. Parker. It's an interesting backward glance to the days when Australia were debating mandatory helmet laws. "There is an embarassing silence from the police and the police unions about their willingness to enforce bicycle helmet laws but, in the closing days of 1987, they went public with the proposal that motorists should wear helmets which they regard as a worthwhile change in the law that they are prepared to enforce." Hadn't heard that one before. That the police went public backing motoring helmets. A little piece of the puzzle falls into place. Our article from back in May 2009 about Australian motoring helmets - "The World's First" - produced by Davies Craig was greeted with chuckles at first. Until we started looking into it and discovering that motoring helmets have been taken seriously, as we wrote about later. But the question of WHY Davies Craig would start producing them has remained vague. We were aware of studies showing the benefits of motoring helmets from the late 1990's but Davies Craig were selling theirs in the late 1980's. A company wouldn't invest in a product like this unless there was a good reason. So it's interesting to learn that motoring helmets were on the agenda and that the police, at least for a while, were backing their use. 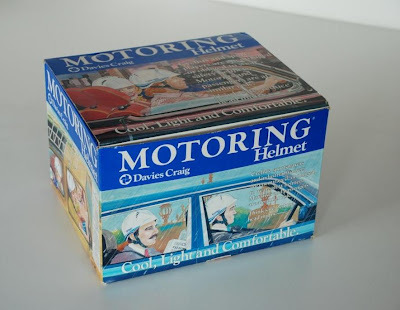 Davies Craig, on the box, say that they had spent 3 years developing the motoring helmet so the subject must have been topical for a while. With that, said, the author questions self-enforcement of helmet laws. He was, it must said, correct. Over 20 years later, the police in most Australian cities may ticket cyclists for riding without, but it's not a priority by all accounts and often it is the exception. Except in Melbourne where urban cyclists are constantly hunted down like vermin. "The design rules for all new cars should be changed so that all new cars come with a complement of bicycle helmets with built-in clips to conveniently store them, on the back seat or under the dashboard, so as to minimise the inconvenience to motor vehicle users." "It is very difficult to take politicians and car driving safety experts seriously when they know so little about head injuries that they don't wear a bicycle helmet in their own cars. I have been wearing a bicycle helmet for ten years because it protects me yet I have never seen any of the hundred or so big-mouthed helmet advocates, who don't ride bicycles, wear a helmet in their car. I wonder why? Perhaps the Cain government should set an example and have all MPs and government drivers wear helmets?" The big-mouthed helmet advocates are still out there and still driving without helmets so little has changed on that front apart from the names and faces. In all the time we've been writing about the issue of motoring helmets I have never heard any good excuse why we shouldn't promote them. From anyone. Even the cycling helmet advocates avoid the issue like the plague. Even though the issue of motoring helmets could be the singlemost potent weapon in the bicycle advocacy arsenal.